Efficient, in-house print production benefits all of our clients. From national firms with recurring print needs to entrepreneurs and artists with custom work. We started our business with custom color and pantone matching. We focus on artistry and skill to create vibrant prints and memorable experiences. Our production relies on traditional technique and equipment, backed up by current technology. Balance of analog printing with digital integration is key to our product. Whether you have a custom full-color run or need high volumes of pantone printed material, our offset presses can handle the job. Offset printing has been a successful and long-lived technique for many reasons. Before we package up your order, we’ve got to address bindery. Also known as finishing, bindery includes cutting, collating, folding and stitching. Every project has unique finishing needs. We’re working with customers to offer sophisticated foil stamped products. Add a touch of gold, silver or bronze for a metallic statement. If you’re the non-glitzy type, consider our opaque foils. Our clients love the look and feel of hand-mixed ink for their print projects. We can mix from standard pantone books, or create a custom color based on your input. Our wide format durable aqueous inkjet continues to impress with its versatility and quality. For oversized posters, wall graphics and outdoor banners, wide format is the way to go. Offices, firms and consulting agencies can order and re-order multiple sets of business cards with ease. We set ourselves apart with our offset printed color accuracy and realistic pricing. Looking for guidance in your design process? Our dedication to print design and client consulting has enhanced our knowledge of core design principles. We’re here to help. We’re adding extra dimensions to your paper and projects. Whether it’s a raised emboss or a deboss, we’ve got the tools to get the job done. Our double flywheel press is designed to produce the consistent, even pressure needed for quality embossing. We use sophisticated techniques to fuse beautifully printed paper with electronic NFC inlays. We offer a full range of printing techniques to enhance your high tech cards. 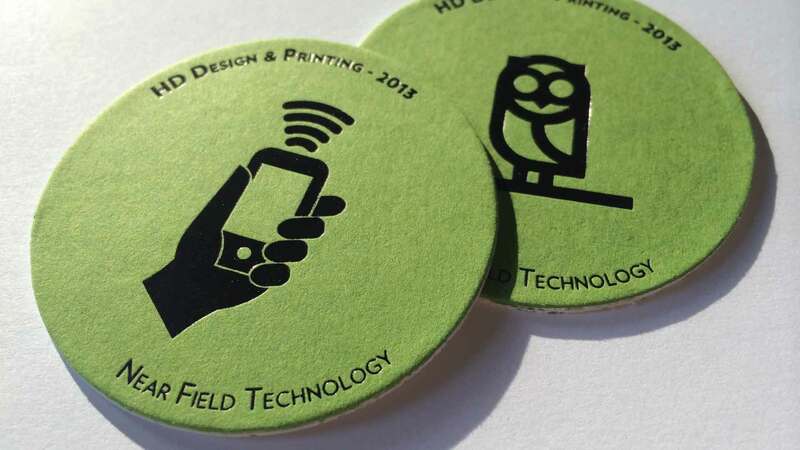 Our Near Field Communication cards and tags include dozens of printing options for a unique and sophisticated final product.